Struthers – A prayer service will be held on Tuesday, Oct. 16, 2018 at 9:30 a.m. at the Clemente Funeral Home with a 10:00 a.m. Mass of Christian burial to be held at Christ Our Savior Parish/St. Nicholas Church, for Jean A. Carney, 85, who passed away Friday morning October 12th. Jean was born on February 22, 1933, a daughter of Anthony and Julia Mika Blaski. She lived in the area her whole life and was a self employed painter and was a member of Christ Our Savior Parish/St. Nicholas Church. Jean was an avid bowler and golfer. She enjoyed sports and coached girl’s softball, and in her younger years she played fast pitch softball as a catcher. 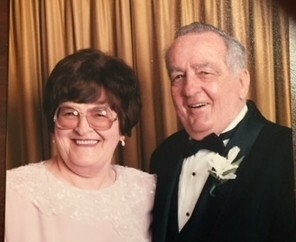 Jean married James P. Carney on August 2, 1958 and he passed away on July 2, 2003. She leaves her children, Michael P. Carney of Struthers, Patty A. (Matthew) Christner of Dawson, PA, Susan M. (Dennis) Croasmun of Ravenna, OH and Betty J. (Jim) Sebastian of Struthers; four grandchildren, Maria (Kevin) Larkin, Kimberly DeLisio, Justin and Jason Croasmun and one great grandchild Serena Larkin. She also leaves her dog, Daisy. Jean was preceded in death by her parents; husband; two brothers Edward and her twin Jack Blaski and one sister Mary Bayne. Friends may call on Monday Oct. 15th from 4:00 to 7:00 p.m. at the Clemente Funeral Home in Struthers.